Scalar Heart Connection is a process that connects us to the source of synchronicity and thereby helps us tap into the innate knowing of our heart. The process utilizes the concepts of quantum mechanics, the archetype of Number as well as the heart's scalar field of unlimited potentiality. It is also based on a variety of disciplines, including sound healing, the I Ching, oriental medicine, chakra balancing, sacred geometry, archetypal personality patterns, astrology, and Family Constellations. From heart-consciousness we can ask the Intelligence beyond time and space to help us understand and guide us through life s challenges with heartful action. Stephen describes the heart as the interface between mind-brain consciousness and the Field of Universal Consciousness. Albert Einstein warned us that we have given mastery of our lives to the reigns of mind-brain consciousness. He encouraged us to re-connect with heart-consciousness, which flows intuitively out of the interconnected fabric of spacetime. Carl Jung referred to the higher intelligence of Universal Consciousness when he asked us to "consider synchronistic phenomena, premonitions, and dreams that come true." He explained that Infinite Intelligence has other ways "of informing us of things which by all logic we could not possibly know." One way Universal Consciousness informs us is through the rhythmic beating of our heart. The heart synchronizes to the heartbeat of the Earth, Sun, Galaxy, and beyond. When we tune in to heart-consciousness, we open ourselves to information, inspiration, and creative insights. We tune in to the heartbeat of the Cosmos. The heart's rhythmic songs of Universal Consciousness washes over every cell in our body, coupling with our brain waves as it radiates out to everyone around us. The heart can give us that little extra help we sometimes need to re-align ourselves with what is positive and life enhancing. One way to communicate with the wisdom of the heart is through a method called Scalar Heart Connection™. The heart is the interface between mind-brain consciousness and Universal Consciousness. Heart-centered consciousness helps to bring us into greater harmony within ourselves and with the planet as a whole. Joseph Campbell said, "The heart is the organ of opening up to somebody else." Scalar Heart Connection™ helps us open to our own heart. When our own heart is open, we are able to open up to the hearts of others. Imagine a planet of people with open hearts, connected to the wellbeing of each other and the health of the planet. It can happen. It is already happening. "The session I had with you shifted my level of happiness. There was more spring in my step. There was a higher sense of well-being. I felt happier even with a lot of things that are going on in my life. I was still able to carry that vibration." 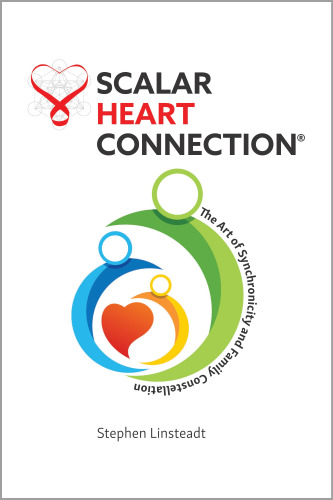 Scalar Heart Connection accesses the power of our own intuitive heart and the Field of information within our family system in a way that allows understanding, compassion, and healing to occur. The process is simple yet profound. It works in tandem with Family Constellation therapy as the heart pinpoints the area of the family system that needs to be addressed. Stephen explains the powerful transformation that can happen in people s lives with this process in a brilliant and easy to understand manner. "Stephen, your manuscript of the "Scalar Heart Connection" is brilliant--I enjoyed all the nuances from scholars and great minds. The scientific research was compelling and fascinating and really makes a case for science confirming ancient wisdom and bringing the planet into a new balance at a higher level of consciousness and coherence. It is a magnificent foundation for jumpstarting awareness and a platform for the workshops and techniques leading to an evolutionary change in humanity and the universe--allowing everyone to realize we are amazing souls with great destinies and that our presence on this earth makes a difference." "The secrets of the Universe seem to have found their way into one book and Scalar Heart Connection is that book. Not only does it synthesize complex theories and ideas of quantum healing and sacred geometry, but it gives you tools in how to apply these secrets in a healing modality that will shift negative and subconscious beliefs. It is profoundly beautiful to read Stephen's story woven throughout the culmination of his life's work to understand on a personal level how he reached such new and breathtaking conclusions. The answer to healing is all around us, but if you need help seeing that, read this book!"